Stir dry ingredients together, cut butter into fine particles. Add milk and stir. 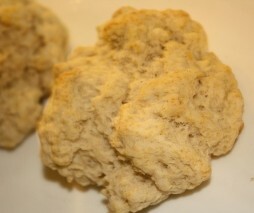 Pat into a ball and separate the dough into biscuits about 1″-2″ thick. If you put the butter in the freezer and grate it into your flour mix then it’s so easy to combine it after that.